pada Kecamatan Sekupang. Kelas potensi kekeringan sedang dengan luas area 9507.12 ha yang dominan terletak pada Kecamatan Sekupang. Kelas potensi kekeringan tinggi dengan luas area 7081.392 ha yang dominan terletak pada Ke-camatan Sekupang, Sagulung dan Nongsa. Kelas potensi kekeringan sangat tinggi dengan luas area 15600.12 ha yang dominan terletak pada Kecamatan Batam Kota dan Nongsa. Drought is the relationship between the availability of water is far below the need both for the necessities of life, agriculture, economic activities and the environment. Information about potential droughts is indispensable for the preven-tion or mitigation to reduce the negative impact caused. As for the purpose of this research is to produce a map of potential drought land in the Batam-based web. In this research utilising remote sensing and GIS techniques. The use of landsat 8 to determine the value of the LST (Land Surface Temperature) and land use overlay and then done the scoring. The final stage of research i.e. performs validation against parameters that influence by taking some samples. 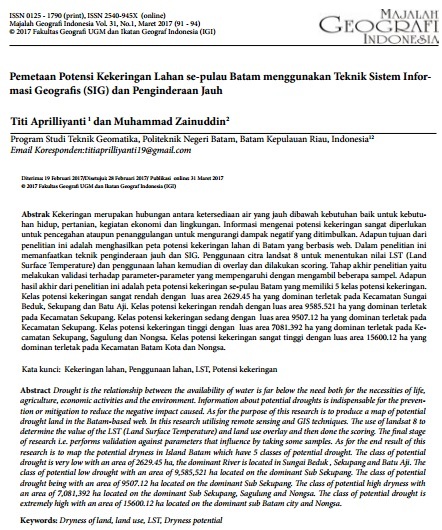 As for the end result of this research is to map the potential dryness in Island Batam which have 5 classes of potential drought. The class of potential drought is very low with an area of 2629.45 ha, the dominant River is located in Sungai Beduk , Sekupang and Batu Aji. The class of potential low drought with an area of 9,585,521 ha located on the dominant Sub Sekupang. The class of potential drought being with an area of 9507.12 ha located on the dominant Sub Sekupang. The class of potential high dryness with an area of 7,081,392 ha located on the dominant Sub Sekupang, Sagulung and Nongsa. The class of potential drought is extremely high with an area of 15600.12 ha located on the dominant sub Batam city and Nongsa.